The NASA Ames National Full-Scale Aerodynamics Complex (NFAC) encompasses two wind tunnel circuits. The first is a closed loop circuit with a 12.2 m x 24.4 m (40 ft x 80 ft) test section, and the second is an open loop branch with a 24.4 m x 36.6 m (80 ft x 120 ft) test section. The second circuit, containing the 24.4 m x 36.6 m (80 ft x 120 ft) test section, was used for the entire UAE Phase VI experiment. Test section speed in the 80 ft x 120 ft circuit varies continuously from nearly zero to 50 m/s. For operating conditions employed during the UAE Phase VI experiment in the 80 ft x 120 ft test section, flow quality parameters were as follows. Speed non-uniformity across the test section did not exceed +/- 0.25%. Low angularity across the test section was 0.5 degree or less. Centerline turbulence intensity was 0.5% or less. Addiitonal details regarding the NFAC configuration, operation, and flow quality can be found in Zell . The UAE Phase VI turbine was a 10 m diameter, stall-regulated machine with full-span pitch control that ran at a constant speed of 72 RPM and had a power rating of 20 kW. The rotor had two twisted and tapered blades, which employed the S809 airfoil across the principal portion of the blade radius. 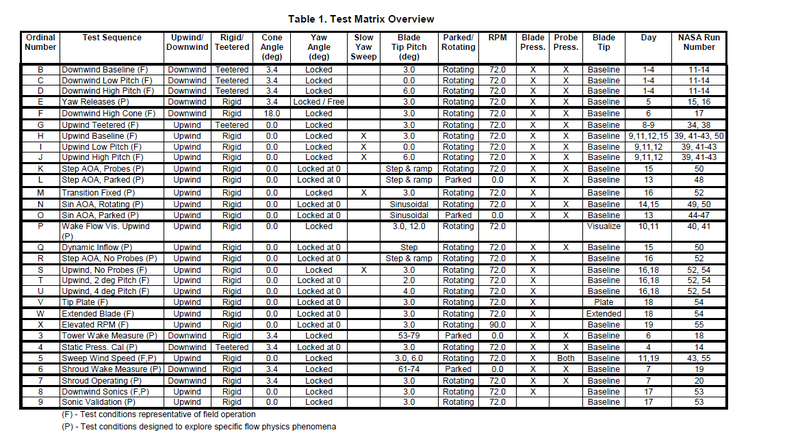 Overall, the experiment encompassed 30 different operating states and configurations, summarized in Table 1 in . These included operating and parked rotor states, upwind and downwind rotor modes, rigid and teetered hubs, flat and coned rotors, multiple blade pitch angles, and other configurations. Some of these operating states and configurations were intended to replicate conventional turbine operation, while others aimed to achieve unconventional though physically relevant rotor or blade aerodynamic states. Turbine measurements included blade surface pressures (5 radial stations), blade inflow angle and dynamic pressure (5 radial stations), blade root bending moments, low-speed shaft torque and bending moments, mechanical and electrical power, nacelle yaw moment, blade tip and nacelle accelerations, and positional measurements (e.g., nacelle yaw, rotor azimuth, and blade pitch). In total, 285 data channels, both measured and derived, were acquired from the wind turbine and wind tunnel instrumentation sets. More details regarding UAE Phase VI data are available in . For most Sequences, the UAE6 file naming convention uses eight characters (also explained on pp. 15–16 of ). The first letter or number specifies the turbine configuration according to the first column in Table 1 of . The next two digits represent the nominal wind speed in meters per second. The next four digits represent the yaw error angle in degrees. For negative yaw error, M (minus) was used. The last digit indicates the number of data collection repetitions completed at that specific flow condition with zero noting the first repetition. For example, the first time the turbine was positioned at 10° yaw, 7 m/s under test configuration H, the file name is given as H0700100. The first time this test point was repeated, the file name is given as H0700101. Some test sequences used a different file naming convention due to the nature of the test. The file naming conventions for these Sequences are explained on pp. 16–24 in . Across all Sequences, the UAE Phase VI database contains two file types. The first is the *.eng file, which contains the calibrated data parameters in engineering units along with all of the derived parameters. These binary files contain a series of 32-bit floating point real numbers. A 30-second campaign consists of 15,625 records for 285 channels, and each record corresponds to one time step of 1.92 ms. The second file type is the *.hd1 file, which contains summary statistics for the *.eng file. The second line lists the number of channels, the number of records in the corresponding *.eng file, and the time step between records. In subsequent *.hd1 file lines, each channel is represented by one line of text beginning with the channel number. The channel description, units, number of calibration coefficients, offset, slope, mean, maximum, minimum, and standard deviation follow. The last entries are the channel type, location of maximum, location of minimum, and number of frames in which an error occurred. All files in the UAE Phase VI database are identical with respect to the number of channels they contain, which is 285. All UAE Phase VI *.eng files can be accessed using the MATLAB script, and all *.hd1 files can be opened and read with any common text editor. Butterfield, C., W. Musial, and D. Simms, “Combined Experiment Phase I Final Report,” NREL/TP-257-4655, National Renewable Energy Laboratory, Golden, CO, October 1992. Simms, D., M. Hand, L. Fingersh, and D. Jager, “Unsteady Aerodynamics Experiment Phases II-IV Test Configurations and Available Data Campaigns,” NREL/TP-500-25950, National Renewable Energy Laboratory, Golden, CO, July 1999. Hand, M., D. Simms, L. Fingersh, D. Jager, and J. Cotrell, “Unsteady Aerodynamics Experiment Phases V: Test Configuration and Available Data Campaigns,” NREL/TP-500-29491, National Renewable Energy Laboratory, Golden, CO, August 2001. Schepers, J. G., A. Brand, A. Bruining, J. M. R. Graham, M. Hand, D. Infield, H. A. Madsen, R. J. H. Paynter, and D. Simms, “Final Report of IEA Annex XIV: Field Rotor Aerodynamics,” ECN-C--97-027, Energy Research Center of the Netherlands, Petten, The Netherlands, June 1997. Schepers, J. G., A. Brand, A. Bruining, J. M. R. Graham, M. Hand, D. Infield, H. A. Madsen, T. Maeda,J. H. Paynter, R. van Rooij, Y. Shimizu, D. Simms, and N. Stefanatos, “Final Report of IEA Annex XVIII: Enhanced Field Rotor Aerodynamics Database,” ECN-C--02-016, Energy Research Center of the Netherlands, Petten, The Netherlands, February 2002. Hand, M., D. Simms, L. Fingersh, D. Jager, J. Cotrell, S. Schreck, and S. Larwood, “Unsteady Aerodynamics Experiment Phase VI: Wind Tunnel Test Configurations and Available Data Campaigns,” NREL/TP-500-29955, National Renewable Energy Laboratory, Golden, CO, December 2001. Boorsma, K., and J. G. Schepers, “Description of experimental setup MEXICO measurements,” ECN-X--11-120, Energy Research Center of the Netherlands, Petten, The Netherlands, October 2011. Zell, P., “Performance and Test Section Flow Characteristics of the National Full-Scale Aerodynamics Complex 80- by 120-Foot Wind Tunnel,” NASA-TM-103920, January 1993.